The popularity of fantasy has exploded from its infancy in 2003 when 15.2 million players participated in leagues to this past year when 56.8 million played fantasy sports. In fact, 19% of the US population and 14% of Canadians played fantasy sports last year. Even more intriguing is the fact that the typical fantasy player spends 3X more than the average guest with an average check of $47. Additionally, 58% of fantasy players visit your establishment with two or more people and 45% of them return 2-3 times per month. Those numbers are amazing, but also elusive, since no one has figured out how to translate fantasy football into sales for restaurants and bars — until now. DFS exploded onto the sports scene with a ferocious push to entice players that weren’t willing to commit to season long leagues. Here’s one more statistic that matters in this conversation: from 2104 to 2015 an additional 15.8 million people became fantasy players. This is proof positive that DFS is a game changer for the casual fan that enjoys the idea of fantasy sports, but isn’t willing to commit themselves to hours of research and management. To refresh: DFS is when a player picks a new team each week. It’s like hosting a brand new fantasy draft weekly. And therein lies the genius — no blown rosters, no nonsense trading deadlines, no bye week hassles. Fantasy players just pick the best roster they can each week and let the fantasy gods decide their fate. As an operator, even if you don’t promote DFS after reading this, you will at least know why folks are interested in an obscure game during Week 17. To make DFS even more attractive for restaurants, platforms like FanDuel are now offering season long leagues that utilize the daily fantasy format. This means you can entice guests into a league that your restaurants sponsors and manages, but they still pick their team fresh each week. It’s the perfect blend of easy and fun, without requiring enormous commitments on the part of a guest. Best thing is that FanDuel does all the heavy lifting and you simply have to invite your guests to participate and incentivize them to continue to play. Every sports themed operator in the county waits for the NFL season to arrive. It means the end of the slow summer struggle and an uptick in the fall. And you know football is back when hear your first rumbling about fantasy and guests start to book those draft parties. Fortunately, draft parties are a great boost to August sales and provides ideal marketing opportunities to your potential regulars. Unfortunately, once the drafts are done, can anyone demonstrate how regular fantasy leagues support their marketing or drive traffic to their restaurant? The irony remains, when a player’s team is no longer competitive they typically go out to watch the games less often, and you see that in the stark reduction of out-of-market game requests from NFL Week 1 to Week 17. The key ingredient that daily fantasy provides is weekly relevance and no penalty for last week’s mistakes. Players start fresh each week. No longer do blown rosters keep regulars at home. By picking a new team each week, your guests can remain interested in the many games you can provide them. DFS acts as guest retention and frequency tool. Traditional fantasy players invest 8.67 hours per week setting lineups, making trades and tracking their team. While DFS players can certainly expend that much energy, it’s simply not a requirement to participate. This allows even a casual fan to get in on the action. They don’t need to rely on others in the league to craft their teams and they can pick a fresh team each week. It’s a way into the competition without the total immersion of season long single team fantasy. With traditional fantasy leagues, there is an upper size limit. Eventually, you run low on quality players and it’s not much fun to start Zach Mettenburg when your opponent has Tom Brady. In DFS everyone picks from the same player pool, but the salary cap forces the teams to be balanced. Armed with every great player, no participant is at a huge disadvantage if the number of entrants increases. 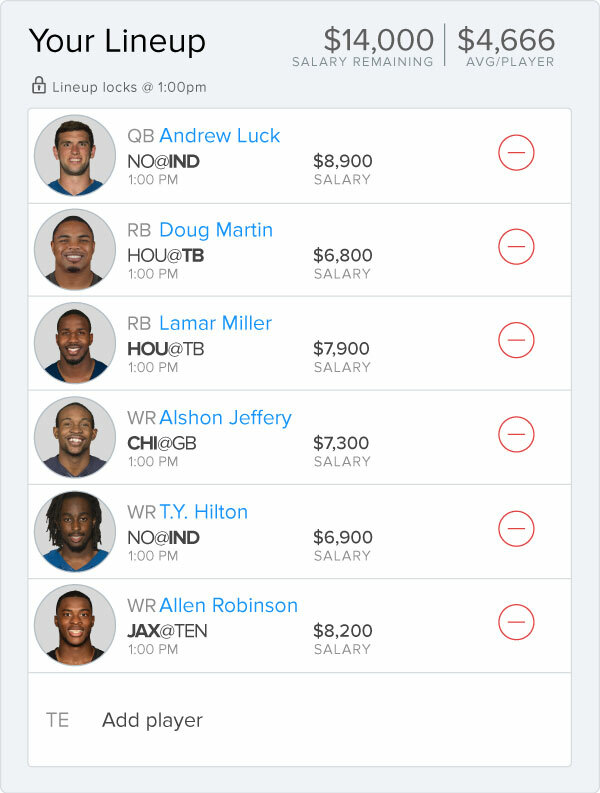 For example, FanDuel ran fantasy games last season where thousands of people entered lineups. No limits means anyone with a smart phone and five minutes can get on board. The problem with traditional fantasy league is the winner isn’t determined until the conclusion of a full season. That’s not the case with DFS. Each week there is a winner who can be rewarded for their participation. There is no limit on how many places you can incentivize either. You can deliver rewards for the top five performers each week if you want. This only augments the experience and the desire to keep playing until the season ends. In the end, no promotion succeeds without a significant effort on your part. However, DFS at minimum delivers all the elements that lead to success. From guest interest (is there anything they are more interested in than the NFL?) to recurring participation opportunities, DFS delivers an incredible base from which to build marketing of the NFL. Given that so many locations now carry the NFL Sunday Ticket, you have to look for ways to differentiate yourself. Hosting a DFS season long league is just the answer you’ve been seeking. 1 & 2: Sources: Beall Research, Brand Tracker Study – Jan-July 2016 $47 avg/check Fantasy Sports Player. Business Insider March 2015 Avg check/person of $15 from Red Robin, Applebees, Chili’s, Texas Roadhouse, BJ’s, Logan’s Roadhouse, BWLD, Outback and Olive Garden.